Earlier this summer, Carson Daly shared his go-to signature summer cocktail, and now Hoda Kotb is joining in on the fun by sharing her perfect mojito recipe. Although Hoda and Kathie Lee Gifford started out the morning by sipping on classic daiquiris, they soon started chatting about drinks they enjoy the most during the summer, on vacation or just at the end of the day. "I don't like a cocktail," said Kathie Lee. "I stick to my vino." 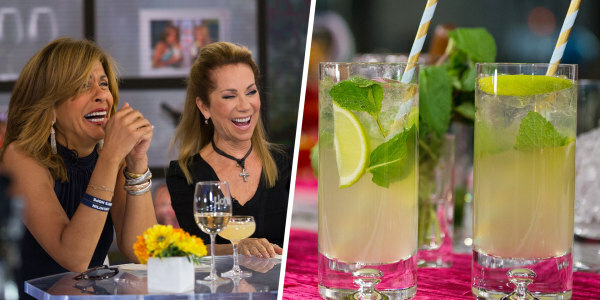 But Hoda was excited to share how she makes her ultimate summer sipper, an "awesome" ginger vodka mojito. Could it possibly take the place of Kathie Lee's beloved wine? "Here's my favorite thing: I take a whole lime. I cut it in half and I squeeze all of the juice out with a fork. Then I get tons of mint, like a fistful of mint, and put it in the bottom and crush it," Hoda said as she mimicked muddling the ingredients. "Then I take some agave and go like that," she said as she hilariously mimicked squeezing out the sweetener and muddling everything together. "Then I take vodka and glug, glug, glug, glug, glug, glug, glug," she said. Now that's a great pour of the booze, but Hoda wasn't done yet! "And then I take a bunch of ice and some diet ginger ale," she said. The final step is to stir it all together and voilà! "That mojito is killer," Hoda declared. But the key is to use fresh lime juice and a lot of it — "lots and lots and lots of lime," she said. While Kathie Lee still prefers wine over cocktails, even she had to admit Hoda's drink is really great. "It's so refreshing," she said.